I spent New Years in Doolin this year. Clare is one of my favourite countires outside of Dublin, and I love the beaches and scenery. No visit to that part of the country is complete without a trip to the Cliffs of Moher. It is one of those places that remind you of how beautiful Ireland is, and why so many people come to visit. So, to the cliffs we headed, but we were surprised to find that there was a relatively steep charge to park in the car park. Previously it had been free, and this set me off on a rant about how ridiculous it was that you would be forced to pay to see a natural attraction (I think everyone was sick of hearing about it by the time we left to be honest). Well, that was nothing. 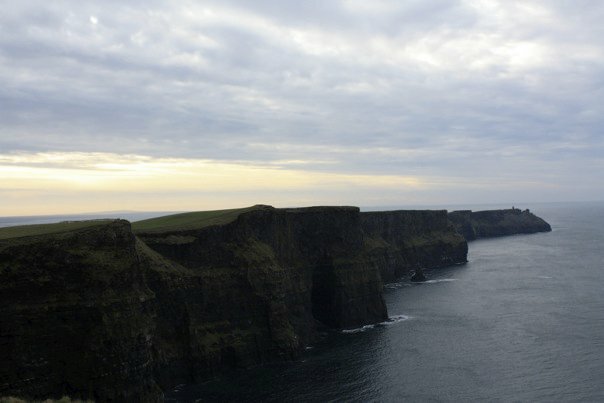 The Cliffs of Moher, a 600ft- high natural landmark in Co Clare, will now be pay per view, in a controversial move seemingly designed to cover the cost of a failing visitors’ centre. The charge will apply to adults only and will also cover admission to the visitor centre. The introduction of the charge comes against the background of the Cliffs Of Moher Visitor Centre Ltd incurring combined losses of €500,000 in 2008 and 2009. Having a visitor’s centre is nice, and I enjoyed having some soup there after walking up the cliffs in the freezing cold, but the prices are exorbitant. We couldn’t believe how much they were charging for a cup of tea, and we weren’t the only people to comment on it. Add to that a cover charge to even be there in the first place, and you can entirely understand why tourists complain about Ireland being a rip-off. 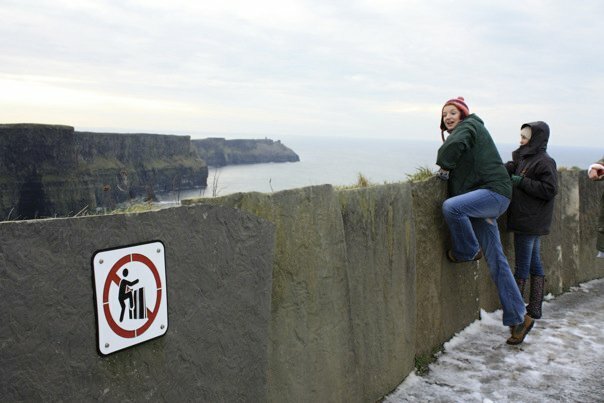 And there are plenty of signs to keep you safe…who knew climbing over the edge was a bad idea?